Board of Trustees meetings will be held every fourth Monday of the month at the Martin County Public Library. The meetings begin at 5:00 P.M. Membership as a trustee is open to all persons over the age of eighteen (18) years and who reside within Martin County. To apply stop by the main library and ask for an application. Preschool Story Time continues on Tuesdays at 11:30 a.m. at the Inez library. Preschool Story Time continues on Thursday at 11:30 a.m. at the Lovely library. We will learn a letter of the week, make a craft, dance, and learn a nursery rhyme. This program is for all preschoolers from ages 3 to 5. Now accepting applications for library board member. We meet on the fourth Monday of each month at 5:00 P.M. Applications can be picked up at each library. With Cypress Resume, your patrons can effortlessly create professional resumes in minutes! Best of all, its easy-to-use format assures they are unlikely to need additional assistance once you show them the site, so you’ll be free to focus on other tasks. Martin County Public Library now offers Zinio magazines in digital format that you may check out and enjoy on your computer, tablet, or smartphone. View full digital copies of your favorite magazines! You see the exact same material you get in print‚ plus some issues include features like video, audio and live links. Magazine issues are not checked out so they're always available any time. Read online or download issues to your computer or mobile device to read offline. You must have a current Martin County Public Library card to use this collection. With Kentucky Libraries Unbound, you'll be amazed as you search, and download more and more media on your PC and portable devices. 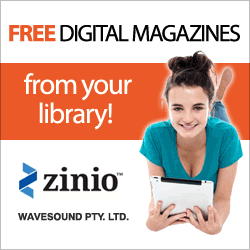 Patrons now have unlimited access to many types of downloadable media such as audio books, e-books, music and videos. All it takes to access Kentucky Libraries Unbound is a valid library card and pin. With download media available 24/7, your library is always open! Get started with a Guided Tour or Quick-Start Guide. All EPUB & many PDF eBooks are ready to enjoy on the Sony® Reader & other devices such as the Barnes & Noble nook™. For a list of known compatible devices, click here. Requires installation of Adobe® Digital Editions. This comprehensive and dynamically updated online resource is an ideal fit for today’s mobile user. Now patrons can access Chilton’s car manuals from library, home, garage or anywhere they have Internet access. What an advantage for the on-the-road breakdown or the need to share information quickly. The ideal resource for students, law school faculty and legal researchers, Legal Forms features a comprehensive collection of major legal publications. This invaluable resource provides indexing for more than 1,500 major law reviews, legal newspapers, specialty publications, Bar Association journals and international legal journals, including more than 250 titles in full text. Price It! Antiques & Collectibles is a comprehensive database for identifying, researching and pricing art, antiques and collectibles. Containing more than 23 million records, it’s a sophisticated, up-to-date, easy-to-use tool whether the user is a professional art appraiser or a budding collector. The Martin County Public Library is pleased to announce the purchase of ProQuest's Ancestry Library Edition. Ancestry is a genealogy research tool with data from census, military records, court, land, probate, vital and church records, passenger lists, etc. It covers Canada, the US, UK, and some European countries. The license covers Authorized Users of public libraries (i.e, library cardholders, walk-in patrons while they are on -site and library staff) through any workstation at the main library. The product is not licensed for remote access. Visit the main library and search your ancestry. Contact the library for details. Click Here. PICKERING'S MOUNTAIN by Joseph G. Anthony is a multi-level tale set in Eastern KY and centering around one family that has lived on the mountain long enough for it to be named after them and another family who has been displaced to Kentucky’s Appalachia from New York - as was the author. Mr. Anthony writes prose like it was poetry with descriptions that draw you into the time and place of each scene. He addresses such important issues as legacy, the problems of small-town newspapers, mountain-top removal vs. jobs, and Bible study in public schools, which culminates in a debate involving a charismatic Baptist preacher and the ACLU. Despite the serious topics, there is plenty of comic relief, much of which comes from the local gossip columnist. This is the best Appalachian book I’ve read in a while.